Really cool, Deborah! Looks good. unfold to its ultimate beauty. Thank you. Thankyou for visiting Betty, glad you enjoyed the blog. Come and visit for real Memorial Day weekend. I hope all are well, it’s great thing you are doing here. Now with all the smart phone and iPhones, everyone can look at your nice artistic work. As artist it’s very important to know about other artist around the work, not only that but also non artist will be able to look at your work and know my good things about you are and your style of work. Debora, this is wonderful. You’re work is absolutely beautiful. The blog is a great way to keep your fans, like me, up to date. Thanks! Hello Debora, I greatly respect your ability to draw the cartoon so well and then be able to paint it afterwards. Illustration is the hardest part for me. Anyway congratulations on you blog. I think you do a pretty good job Jennifer. Your flowers and woodland scenes are lovely. If you want to learn more about graphic techniques for stained glass there are two people I know who teach this. The other one is Nancy Nicholson who is offering such a workshop at this year’s AGG conference in St Augustine next month. She is brilliant and it’s sure to be a good class. Here’s a link to my workshop in August. You are so talented stained glass artist. Your work is outstanding and very unique BRAVO ! How did you hear about my blog Lucie? and do you also make stained glass? 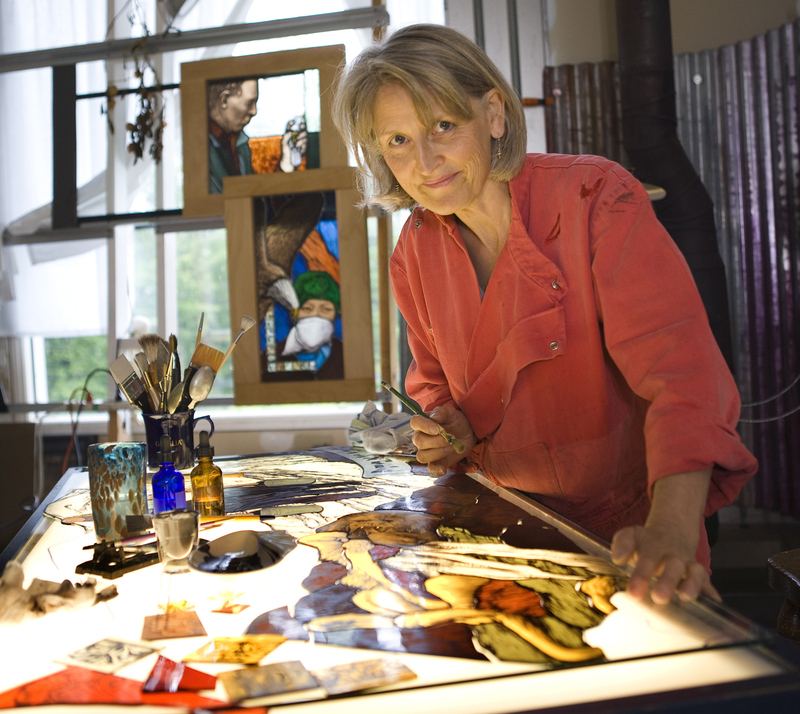 I always looking for stained glass artists and I did found your wonderful art on line. I am beginner in stained glass painting and very interested in all techniques regarding glass art. If I lived closer I certainly go for a visit of your studio and ask for some advices from your experience. I follow you on Facebook, you are in my dear friends. Hi Deborah! Your new blog space looks great. Very inviting. Thanks Patti, good of you to take a moment to look at it. As you can guess, I’ve barely a clue as to how it all works but an enjoying the process nevertheless. You have been on my mind…The website is beautiful, very clean and easy to use. I am forever grateful for your kindness, encouragement and hospitality and will long remember my time spent learning and creating in your studio.